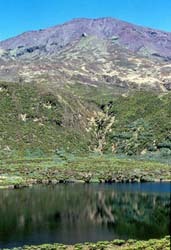 The Base is the area between the cliff tops and volcanic cone, split by the gulches and home to The Ponds and many parasitic cones. Islanders recognise The Base as the region between the sheer cliffs which encircle Tristan, and the central Peak cone. 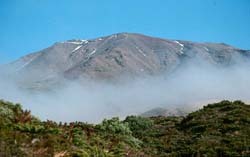 This picture is taken from near the edge of The Base, with typical Blechnum palmiforme (dwarf tree ferns) in the foreground and mist hiding the grassy upper base with the peak cinders beyond. 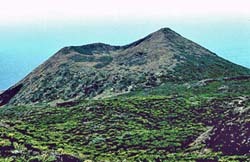 Big Green Hill is one of many parasitic volcanic cones found on The Base. Dated at 11,000 years old, this cone is at the edge of the sea cliffs above Big Point. The Base has many volcanic features including the three explosion craters now occupied by lakes, known modestly by islanders as 'The Ponds.' the photograph left is a view across the Top Pond to where a permanent stream (arising from a peat bog in the middle distance which maintains water flow) flows in a shallow valley. 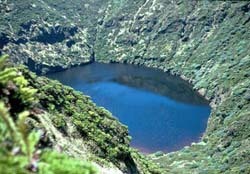 The Bottom Pond, right, is a crater lake in the largest of the three explosion craters. The tree ferns grow much taller in this crater as they are sheltered from high winds, and thrive on the rich volcanic soil, now layered with peat from decayed vegetation.